Computer-related health problems ranging from eyestrain, headaches, neck, wrist, elbow and back pain to more severe Repetitive Strain Injuries (RSI), including carpal tunnel syndrome, writer's cramp, tendonitis, etc. are the result of inappropriate computer use. MacBreakZ offers a unique way of acquiring ergonomic skills that can save you a lot of discomfort and shield you from serious health and career-threatening injury. While preventative measures may quickly improve some milder conditions, such as eye strain, tension headaches or neck & backache, recovery from more serious injuries and inflammations require a long-term approach. A gradual return to computer use must be carefully monitored and new life-long habits must be acquired, as even a single short return to old habits can lead to a severe relapse. The break reminder component of MacBreakZ features sophisticated keyboard and mouse monitoring (without invading your privacy) that allows it to react to the way you are using your computer. What's more MacBreakZ provides you with instant feedback on how you are doing and thus lets you find out more about your work habits. 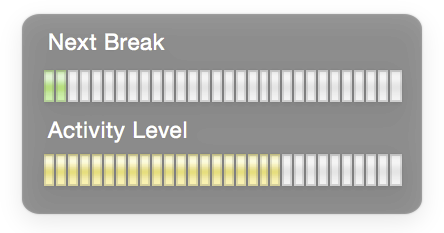 MacBreakZ lives in your menu bar and its icon displays your current activity level, as well as how much time is left until your next break. Taking regular rest breaks is the foundation of both RSI prevention and recovery. MacBreakZ optimizes the time between breaks and their duration by taking into account all relevant factors including: the time elapsed, your activity level and your personalized profile. MacBreakZ offers a collection of 42 stretches covering all major trouble spots around your body. Stretching reduces muscular tension, strengthens appropriate muscle groups, and improves blood circulation and posture. When it comes to ergonomics, everyone is different and one size definitely only fits one! This is why MacBreakZ offers a vast array of customization options to allow you to zero in on your optimal setup. MacBreakZ features a gradual adaptation of the interval between breaks and their duration. This facilitates a gradual return to work, as well as making it easier to get used to taking regular rest breaks. Our sophisticated Setup Assistant helps you customize MacBreakZ to suit your individual requirements and preferences. Most computer-related health problems can be prevented or at least mitigated through basic awareness of proper techniques and work station setup. MacBreakZ provides dozens of ergonomic tips designed to educate and provide guidance. Microbreaks are very short (no more than a couple of seconds), but frequent breaks that are based around your actual keyboard and mouse usage. They are designed to identify and prevent the damage caused by long periods of intense typing or mousing and are of special significance during recovery. MacBreakZ's innovative user interface is designed to keep you informed and provides you with ample warning of impeding breaks. MacBreakZ won't steal your focus, but waits until you have finished typing and mousing before starting a break. It is easy to temporarily disable for presentations. If you prefer not to advertise your use of a break timer, MacBreakZ offers a special "stealth" mode that provides only minimal feedback that would not be obvious to anybody looking at your computer screen.